The Heavy Duty Diamond Dek Sponge mat is extra thick provides sure footing in a variety of applications. Beveled edges and colored safety borders promote safety while reducing fatigue on the legs and back. Measures 36" width by 60" length by 0.875" thickness. Black with yellow border. Heavy duty matting with Diamond tread pattern provides sure footing in a variety of applications. 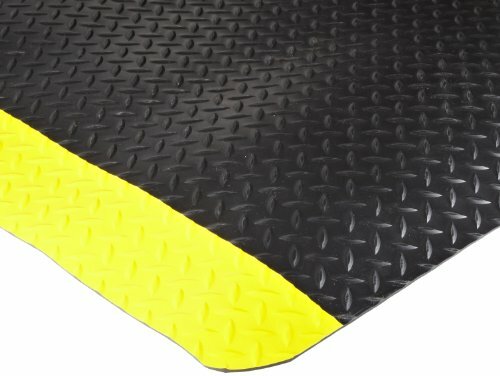 Beveled edges and colored safety borders promote safety while the industrial grade foam reduces fatigue on legs and back. Foam backing is resistant to many common oils, alkilydes and acids. 5/32" Vinyl diamond-dek surface bonded to a resilient 3/4" thick foam.